Specializing in handmade jewelry that is both functional and comfortable to wear, Hanne Undlien’s designs offer timeless expression, lasting for generations. Starting as a licensed physician, she studied medicine at the University of Oslo, graduating as a medical doctor in 1992. She has worked as a General Practitioner in Oslo since 1994, completing her specialty in Family medicine in 2001. Today she works in a partnership with 3 doctors in central Oslo. In 2007, while taking a year off in Baltimore, USA, she decided to pursue jewelry design, taking a class in silver soldering at the Gem Cutters’ Guild. Back home in Norway, she realized that there existed a jewelry schooling universe. That initial curiosity sparked a journey. She visited and took courses in Florence Italy, Sweden and Denmark, and Norway. While in Italy (2015), she received mentorship and tutoring from Daniela Boieri, a leading jewelry artist, at Alchimia (a contemporary jewelry school), learning the latest designs and techniques. 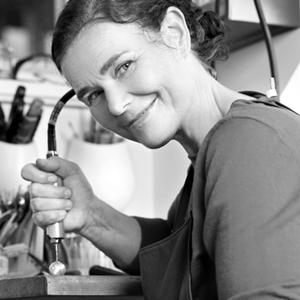 Hence, Hanne Undlien is like many renowned artists: self-taught and without formal jewelry education. Primarily working with sterling silver, she also utilizes gold as a design element in some pieces. Gemstones, which she sets herself, include black and white diamonds and tsavorites (green garnets). Dr. Hanne Undlien’s inspiration undoubtedly comes from mother nature. Of all her creations, the human body is the masterpiece. The perfect balance consists of finely tuned features, a complex network of communication, and a unique insight: how all of the body’s features and interconnected systems need to be coordinated relative to each other. She rejoices over the rhythm of moving joints: the power that unfolds and the unconscious and yet perfect motion that just happens as a matter of fact. Fascinated by the interactions and precision, the human body offers almost limitless learning opportunities. It is engineering perfection with masterful mechanics that cannot be reproduced. • Writes a blog for Plnty, a celebrated magazine for art and design. Undlien design is located in Sagene (Oslo) near the old industrial area along Akerselva. In a small workshop at Våghalsen, she creates inspired works. She divides her week in up to seven workdays. Always three long and rewarding days with her patients and then the rest of the week indulging her self in the studio with precious metals, tools, and fire.